I have done a good deal of running around in America seeking the best place, but all my sorrow I have lost by it. The American country is gone. Migration is often perceived as a two-stage journey: departure and arrival. The letter quoted above from Patrick Kearney to his brother reveals that often a migrant’s journey did not end at the first port of call. His pitiable disappointment at having little to show for all his years of “running around” challenges the myth of the American dream. As one historian notes “the emigration movement…is heroic to look back on… but for the individual emigrant it was often a personal tragedy.” Historians have challenged the assumption of destined success, but many continue to focus on either the negative or positive experiences of migration, neglecting the breadth of possible outcomes and opinions for a more limited binary either/or explanation. Different feelings on this movement can be found within the same ethnic group and social class. Irish-born Seamus Ó Muircheartaigh and Kate Flanagan both moved to several countries and states across America in search of work but their views display a certain dissonance. In “Mo chiach mar a thána” (“Alas that I ever came”) Ó Muircheartaigh wrote “Sin mar a chaitheas-sa tamall dem shaol,/Ó bhaile go baile gan toinnte ar mo thaobh” (That’s how I spent part of my life,/Going from place to place, with no company at my side). Some held a much more positive opinion, like Kate Flanagan who wrote to Mike, her brother-in-law in Ireland, telling him that “I can’t help but think it would be better for all the family in Ireland to come to this country,” humorously adding “if it was only to get away to a more agreeable climate.” Remembering that we can move beyond a dichotomy of good or bad, or immigration as from origin to destination, would allow for more novel attempts to explore the varied experiences among different ethnic groups, and more importantly, to highlight and explain the importance of transience among immigrants in the Unites States in the nineteenth and early twentieth century. How frequently did people move from one place to another? What were the impediments or facilitators of this movement? Was transience purely an economic decision? How were communities affected by the changes over time and place? What were the networks that sustained them and how were these networks in turn sustained? Of course you can question, why should we focus on immigrants and mobility when looking at American workers? The first response to that question is that the late nineteenth and early twentieth century witnessed a huge movement of people to the American continent enabling the industrialisation of the United States. We should keep in mind a notable recent work documenting this process, A Nation by Design: Immigration Policy in the Fashioning of America by Aristide R. Zolberg, which reveals that the popular image of uncontrollable waves of people entering the US is a false one and that the American government was capable, when willing, to limit this movement. Another answer to this question lies in the large numbers of people. While only 13 percent of the population of the United States are classed as foreign-born in 1880, 42 percent of those engaged in manufacturing or extraction industries were immigrants. This number grows into an overwhelming majority if we include the children of foreign-born and African Americans. The importance of immigrants in the development of American industry is hard to overstate. Simultaneously there are problems with categories, as people are often grouped into broad headings based on religion, nationality or ethnic group that might not be particularly useful. If we scratch the surface of these broad communities and we find further important differences; northern and southern Italians, Corkonians and Fardowners, Cornish and English to name a few. Nationally based fraternities (e.g. the Ancient Order of Hibernians in the case of the Irish) tried to foster ethnic cooperation and promote a hyphenated identity reconciling their Old World origins with their lives in the New World, a somewhat paradoxical effort, and again we should try to bear in mind to local complexities when detailing particular groups. Likewise leaders in trade unions also engaged in contradictory efforts to remain loyal to both their own ethnic group while promoting unity with workers from other backgrounds. Immigrants also exhibited similar diversity in their patterns of movement. ‘New immigrants’ from eastern and southern Europe bucked earlier immigration trends, with larger numbers returning ‘home’. Historians estimate that fifty percent of Italians returned home between 1908 and 1923, compared to single-digit repatriation rates for Russian Jews and the Irish. Contemporaries noted this difference at the time with usage of the label ‘sojourners’ rather than ‘immigrants’, but few historians have addressed the question of how this affected their views of movement and migration. A continuing reexamination of immigrants bearing these problems in mind might reveal that immigrants had a more nuanced sense of self and association than historians have previously ascribed to them. Sixty-three years ago the historian Eric Hobsbawm opened his article “The Tramping Artisan” with the statement “the story of nineteenth-century labor is one of movement and migration.” While his article represents an attempt to explain the personal and social impact of frequent dislocation on skilled journeymen in Britain, the premise applies equally to immigrant workers in America. The development of transnational history has seen a reevaluation of borders as the defining parameters of historical phenomena and the scholarship related to them. Some of the exciting new work on Irish America includes Beyond the American Pale: The Irish in the American West 1860-1910, Irish Nationalists and the Making of the Irish Race and The Dynamiters: Irish Nationalism and Political Violence in the Wider World, 1867-1900, and they each forcefully challenge traditional historical assumptions on the Irish in the West, Irish identity and organizations. Transnationalism in turn has led to the reexamination of people’s movement, formerly through the prism of migration, through the more broad term of mobility. Many questions are waiting to be answered by future projects. Some questions that can be raised about American studies follow, but many other similar questions could be asked of other sub-fields of nineteenth and twentieth century history. What effect did the staggered migration have on working-class ethnic communities? Did it impede or encourage ethnic, fraternal or union organization? How did the immigrant experience in eastern cities differ from the American West? Were there significant similarities or differences in both the experience and perception of mobility between ethnicities, occupations or classes? Some of these questions have been partly answered in relation to specific groups, for example Liping Zhu and Sue Fawn Chung’s pioneering work on the Chinese communities in the American West. Simultaneous with the advent of these new approaches has been the comparable decline of the study of labor and trade union history and in response historians should try to reengage with the history of workers, offering fresh perspective and utilizing the new historiographical approaches that have emerged in the intervening decades. Craig Calhoun recently presented an important challenge to labor history in The Roots of Radicalism: Tradition, the Public Sphere, and Early Nineteenth-Century Social Movements, arguing that not all social movements were inherently progressive and that these groups expressed a much broader spectrum of goals and beliefs, often more conservative, than historians have credited to them. It can be hoped that further research will uncover more stories of people’s lives, with their accompanying perceptions and convictions and help us determine whether these are valid assertions. For my part I fully intend to keep digging for answers. Séamus De Búrca (ed. ), The Soldier’s Song: The Story of Peadar Ó Cearnaigh (Dublin: P.J. Bourke, 1957), p. 251. Terry Coleman, Passage to America: A history of emigrants from Great Britain and Ireland to America in the mid-nineteenth century (1972: London: Hutchinson & County), p. 248. Seán Ó Dubhda, Duanaire duibhneach : i bailiú d’amhránaibh agus de phíosaibh eile filidheachta a ceapadh le tuairim céad bliain i gCorca Dhuibhne, agus atá fór i gcuimhne agus i mbéaloideas na ndaoine ann (Baile Átha Cliath: Oifig Díolta Foillseacháin Rialtais, 1976),132-133. English translation by Dr Bruce D. Boling, Brown University, from Kerby A. Miller, Emigrants and Exiles: Ireland and the Irish Exodus to North America (New York: Oxford University Press, 1985), p. xiii. Kate Flanagan to Mike in Ireland was more positive Napa, California to her brother-in-love, Mike 31 March, 1899. Flanagan Family Letters. Private collection generously shared with me by Professor Kerby A. Miller, University of Missouri, Columbia. Aristide R. Zolberg, A Nation by Design: Immigration Policy in the Fashioning of America (Cambridge: Harvard University Press, 2006). U.S. Tenth Census, 1880, Report on the Manufactures of the United States (Washington, D.C, 1882), pp. 17, 36. Mark Wyman, Round-trip America: The Immigrants Return to Europe, 1880-1930 (Ithaca, NY: Cornell University Press, 1993), pp. 9-12. Two important exceptions are the collection of essays in Dirk Hoerder (ed.) Labor Migration in the Atlantic Economies. The European and North American Working Classes During the Period of Industrialization (Westport: Greenwood Press, 1985) and Donna R Gabaccia, Italy’s many diasporas (Seattle : University of Washington Press, 2000). E. J. Hobsbawn, “The Tramping Artisan,” The Economic History Review, New Series 3 (1951): pp. 299-320. David M. Emmons, Beyond the American Pale: The Irish in the West 1845-1910 (Norman: University of Oklahoma Press, 2010), Bruce Nelson, Irish Nationalists and the Making of the Irish Race (Princeton: Princeton University Press, 2012) and Niall Whelehan, The Dynamiters: Irish Nationalism and Political Violence in the Wider World, 1867-1900 (Cambridge: Cambridge University Press, 2013). Transnationalism does not ignore nationalism or the nation-state rather it prompts historians to simultaneous consider “differing geographic scales – the local, the national, and the transnational.” Ian Tyrell, “American Exceptionalism in an Age of International History,” American Historical Review 96 (1991): p. 1033. Liping Zhu, A Chinaman’s Chance: The Chinese on the Rocky Mountain Mining Frontier (Niwot: University Press of Colorado, 1997); Sue Fawn Chung, In Pursuit of Gold: Chinese American Miners and Merchant in the American West (Urbana: University of Illinois Press, 2011). 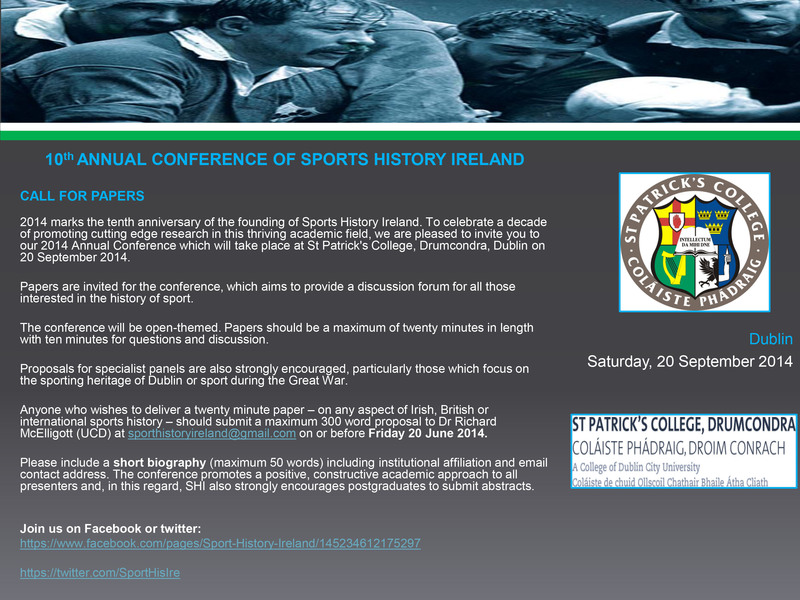 Call for Papers: Sport History Ireland 10th Annual Conference. Here on the Dustbin, I have been responsible for a substantial amount of sport history appearing on the blog since we began. So it is with great pleasure that I post today to bring to your attention a major milestone in the historical study of sport in Ireland. Revisiting E.H. Carr’s What Is History? 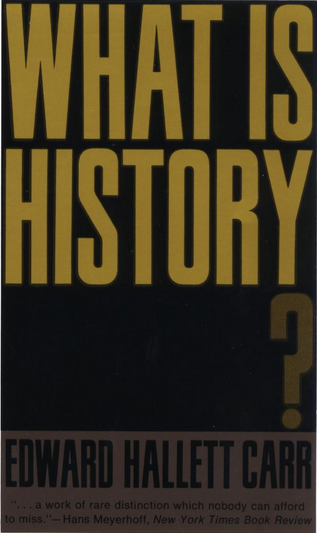 My first introduction to historiography came in the shape of E.H. Carr’s 1961 text What Is History? in a European History course in my final year of high school. I had long been interested in history and had the benefit of excellent teachers but had never read anything specifically on what it meant to do or to write history. Carr’s book, based on a series of lectures delivered at Cambridge but aimed at a much wider audience, is clear and thought provoking and its central ideas have stayed with me ever since. (I still have the original essay I wrote about it for the high school class so that provides accurate evidence of my perspective at the time!) I recently bought a newer edition of the book and decided to revisit it, to see if my training as a historian has altered my perspective. The purpose of this piece is not to evaluate him in relation to contemporary thinking but to reflect on his core ideas, many of which have remained the subject of historiographical debate in the subsequent decades, though the language we use to discuss them may have changed. On the first encounter, at the tender age of sixteen, What Is History? provoked two main reactions in me: First, it reinforced some ideas about history that I had only picked up subconsciously before – that how history is written depends on when it is written and who writes it and that the narratives created are not objective because they involve the selection of facts or evidence. Second, I remember being frustrated by its somewhat theoretical or abstract nature – even though Carr uses examples, they were probably more familiar and current to his audience at the time and left me still wanting to know more about the application of his ideas. Over fifty years have passed since Carr first delivered his ‘broadside on history’ and in any analysis of it we cannot escape the statement he made at the beginning: ‘When we attempt to answer the question, What is History?, our answer, consciously or unconsciously, reflects our own position in time, and forms part of our answer to the broader question what view we take of the society in which we live.’ This principle applies not only to texts on historical subjects, but also his own, which does indeed reflect his position in time – the atmosphere of post-war Britain and the Cold War. Certainly it’s now unacceptable to refer to the historian consistently using the male pronoun, but I’ll excuse Carr on that point given his generation! Many of the examples he uses to illustrate his points also come from the realm of political history, though there are occasional hints at the emergence of social history: ‘People do not cease to be people, or individuals individuals, because we do not know their names,’ even if he only attaches significance to these nameless individuals when they act en masse. The idea that a historian’s writings reflects his/her own era is related to Carr’s more general ideas about bias and interpretation. The term bias is often taken to have a negative connotation, but in this case it means something closer to perspective that effects interpretation. These ideas largely come through in the first chapter, ‘The Historian and His Facts.’ Carr’s argument gets a bit bogged down by his attempt to define what a ‘fact’ is and how it becomes a ‘historical fact’, but for the purpose of examining his ideas they can be viewed essentially as the raw materials of history or, the term most commonly used today, evidence. History, then, is written through selection of facts/evidence and this process is an act of interpretation. (I have found this idea one of the most difficult to instil in students, who, coming straight out of secondary school still seem to think books equal unquestionable truth.) Based on Collingwood’s ideas, Carr states three main points: ‘history means interpretation’ (historians tend to find what they’re looking for); the historian needs an ‘imaginative understanding’ of the mindset of the people he/she studies; and we can only look at the past ‘through the eyes of the present’ as even the language we use embodies that perspective. However, he recognizes the dangers of complete skepticism, subjectivity, post-modernism, and all the other post-isms that this view might seem to suggest, that we could be left with either with a history that has no meaning or an infinity of meanings. The way he seeks to resolve this apparent contradiction is through the idea of ‘reciprocal action’ on two levels, ‘between the historian and his facts’ and ‘between the present and the past’. And thus we have the idea of historiography! For example, I don’t think any scholar of American immigration history today sees Oscar Handlin’s The Uprooted and its narrative of assimilation / Americanization as the definitive text on the subject, and yet they still read it and reference it because of its place in the development of the field and to show the distance between it and contemporary work. We are in the business of constantly revising the past. Much has changed in the world and in historiography since Carr’s time and from the standpoint of the present we recognize his shortcomings: his somewhat elitist view on the eve of the revolution brought by social history, his focus on the political and on history as a ‘science’, his belief in ‘progress’. Nonetheless, I think his ideas about the working process of the historian, with its subjectivity and continual series of revisions, remain central our discipline at all levels – teaching, research, and writing. This post is dedicated to Dr. Christian Nøkkentved, affectionately known to generations of students as ‘Doc Nok’, a member of the history faculty at the Illinois Mathematics and Science Academy who retired this year. I am forever grateful to him and the other members of the department for their time and enthusiasm, which continue to inspire me today. I first read Carr’s book in his class and he is in many ways responsible for my interest in social history. E.H. Carr letter to Isaac Deutscher, March 1960, in Richard J. Evans, introduction to E.H. Carr, What is History?, 2nd ed. (Palgrave Macmillan, Basingstoke, Hampshire, 2001), p.xix. Carr, What is History?, p.2. Carr, What is History?, p.44. Carr, What is History?, pp.18-20. Carr, What is History?, pp.20-21. Carr, What is History?, p.24. Last Friday (26 April) I attended a workshop at Trinity College Dublin organised by the Transnational Ireland Network. It brought together members of the network, founded about a year ago, and postgraduate students to discuss definitions of and approaches to transnational history, particularly in an Irish context. Can you employ transnationalism in the pre-national era? If part of the goal is to move beyond grand narratives of the nation state, to what extent do narratives of globalization replace them and is this not an equal danger? Who has a right to call the world borderless? Is this not somewhat self-indulgent on the part of academics? Can transnationalism be about more than just ‘crossing borders’? How is it experienced ‘at home’ and is it possible to do a transnational micro-history? Is transnationalism simply new terminology for the same methods employed before, such as in Atlantic history and imperial history? Why do transnational history and are there certain subjects for which it is particularly suited? Is transnational history a challenge to Irish (or any other nation’s) exceptionalism? To what extent does transnational history address issues of connection vs. disconnection and inclusion vs. exclusion? I am now realising that in my notes on the discussions I wrote down far more questions than answers! Nonetheless, without even having direct answers, the act of thinking and talking about these topics was itself very worthwhile. Much of the first half of the workshop was devoted to defining transnationalism and its key questions, issues raised in numerous academic articles, which despite their length do not always provide decisive conclusions and when they are particularly abstract they also tend to leave questions of application. While I do think it worthwhile to define the terms we use for clarity, sometimes debates over exact distinctions can eclipse their usefulness and become somewhat pedantic. A useful short definition suggested by Enda Delaney is the movement of people, goods, and ideas across national boundaries and the effects of that movement. This is broad enough to encompass different methodological approaches: political, economic, intellectual, social, or cultural history can all be transnational and it becomes instead a ‘way of seeing’. Its intention is not completely rewriting the canon of history, but revisiting familiar sources and retelling the story. The push towards transnational history began in the US in the early 1990s, but it has continued to retain currency. A brief search for ‘transnational’ in Perspectives on History (a publication of the American Historical Association) turns up four articles in the last six months, suggesting the approach has, if anything, gained popularity and prevalence in historiography. However, it is only relatively recently that Irish historians have begun to heed this call. Despite the large and widespread diaspora, Irish history largely developed a hegemonic ‘island story’ focused national political issues and events. As Delaney writes, ‘what has emerged over time are two separate fields of historical writing: one covering the “homeland”, or domestic history, the other concerned with the “diaspora”, or migrant communities, and only rarely do these historiographies collide’. Transnational history offers the potential to integrate these and give them more equal weight and by doing so it opens new areas of research and creates new historical knowledge. This is particularly relevant to my research, which focuses on oral histories of migration from Ireland to the United States and Great Britain between 1945 and 1970. Doing transnational history enables me to follow the life stories of migrants, connecting their point of departure with that of arrival (and sometimes with return), while offering an element of comparison between Irish communities across the diaspora. This also challenges the issue raised during the workshop that elites were somehow ‘more transnational’ than ordinary people, which is an incorrect assumption, particularly in the Irish context. Likewise, the focus on political aspects of transnationalism during the latter two sessions of the workshop also in some way suggests elitism. Many different people, from the working class up, lived transnational lives. This approach to history offers the potential to reconstruct their worldviews and the complexities of their experiences and in doing so to create a fresh perspective. ‘Ideally, transnational history is a “way of seeing”’, writes Sven Beckert, by which he means it can include a variety of methodologies and questions. He elaborates on this by saying, ‘it takes as its starting point the interconnectedness of human history as a whole, and while it acknowledges the extraordinary importance of states, empires, and the like, it pays attention to networks, processes, beliefs, and institutions that transcend these politically defined spaces.’ ‘AHR Conversation: On Transnational History’, American Historical Review, vol.111, no.5 (Dec. 2006), p.1454, p.1459. Matthew Pratt Guterl, ‘AHR Forum: Comment: The Futures of Transnational History’, American Historical Review, vol.118, no.1 (Feb. 2013), pp.130-9. The increasing popularity of transnational history has been referred to as the ‘transnational turn’. Luke Clossey & Nicholas Guyatt, ‘It’s a Small World After All: The Wider World in Historians’ Peripheral Vision’, Perspectives on History (May 2013); Lisa A. Lindsay, ‘The Appeal of Transnational History’, Perspectives on History (Dec. 2012); Mae M. Ngai, ‘Promises and Perils of Transnational History’, Perspectives on History (Dec. 2012); Mart A. Stewart, ‘Teaching Transnational American History in a Study Abroad Program: America and Vietnam’, Perspectives on History (Mar. 2013). Enda Delaney, ‘Directions in Historiography: Our Island Story? Towards a Transnational History of Late Modern Ireland’, Irish Historical Studies, vol.37, no.148 (Nov. 2011), p.86. Frank Ryan is a figure who consistently inspires comment and interest despite the rather small role he played in Irish history. Famous left-republican leader and Gaelic scholar in the 1920s and 1930s, Ryan led the Irish who fought for the Spanish Republic against Franco during the Spanish Civil War until his capture in March 1938. The abiding interest however, concerns the question of what Ryan, famous anti-fascist leader, was doing in Nazi Germany during the Second World War? This is the central question the aptly titled ‘The Enigma of Frank Ryan’ seeks to address. The narrative of the film situates itself around Ryan’s time in Berlin, where, through flashbacks, Ryan examines his previous life in Ireland and Spain. Combining dramatic reconstructions sliced with real archival footage, the film overall is an interesting and enjoyable one. From certain newspaper headlines previewing the film I had the impression that Ryan’s life would be dealt with in simplistic black and white terms – Frank Ryan, Nazi collaborator, end of story. However, upon viewing, I was pleasantly surprised that this was not the case. The director Desmond Bell has avoided the easy route of sensationalism, and has instead provided a nuanced portrait of Ryan’s time in Berlin. Released from Burgos jail into the hands of the Nazis in July 1940, Ryan found himself seemingly a free man in Berlin. Bell does well in portraying the ambiguities of Ryan’s situation. Initially, Ryan does not know what interest the Nazis have in him until he is brought to a meeting with Seán Russell, IRA Chief-of-Staff. Russell, a purely military man, is in Germany to seek assistance for the IRA from the Nazis – my enemy’s enemy is my friend – and wants to bring Ryan back to Ireland with him. Ryan chastises Russell for seeking help from the Nazis, but accepts his offer of a trip home to Ireland via U-boat when Russell assures him that he is only offering Ryan a way home, nothing more. Nevertheless, when Russell dies en-route, Ryan decides to return to Berlin. Here the Nazis keep him in order to use him in the event of an invasion of Ireland – by Britain or Germany. Ryan is therefore not a prisoner, but nor is he simply free to do as he pleases. Yet Ryan is never shown as collaborating with the Nazis. He never acknowledges the ‘Heil Hitler’ greeting, refuses to be used for a propaganda broadcast to Ireland, and seeks answers to the purpose of the concentration camps. Although there is no evidence for any of this, nor is there any real evidence that Ryan directly assisted the Nazis, and Bell uses his artistic license well to develop scenarios which appear balanced, and assist in portraying the confusing and complicated situation Ryan found himself in. Despite this, the same standards are not applied to the rest of the film. Ryan’s life in Ireland and Spain is incredibly condensed and abounds with unnecessary historical inaccuracies. This is to the detriment of the film as a whole, which appears rushed and sloppy. No real effort is made to develop the character of anyone other than Ryan, and coupled with bad acting, ensures that everyone comes off as one-dimensional caricatures. It is to be expected in a biographical film that certain parts of a person’s life must take precedence over others. It is also reasonable that a director should be able to change aspects of the history in order to develop the plot. For instance, the relationship/conflict between Ryan and Russell looms larger in the film than it did in real life. In my opinion, this is a valid reworking in order to prepare the audience for their encounter in Germany, and so assists in telling the overall story. Similarly, although it would have been better if more attention was paid to the reasons behind Ryan’s disillusionment with the IRA and the development of Republican Congress, it is reasonable that this is condensed in order that more time is devoted to examining his life in Germany. What is unacceptable however, are inaccuracies where none need exist. There are small mistakes, such as incorrectly dating the Eucharistic Congress to 1934 instead of 1932 which can be forgiven. The main inaccuracies concern Ryan’s time in Spain, by far the weakest part of the film. Not only are Ryan’s fellow International Brigaders reduced to a status commensurable with those of unthinking puppets, there are so many inaccuracies here that a historian could be forgiven for thinking that the makers of the film took no more than a cursory glance at the material concerning Spain. To give two small examples; we see Ryan walking over the Pyrenees in December 1936 when in fact he was driven over and we see Rosamund Jacob pleading with Ryan when he is home in Ireland in May 1937 not to go back, saying the International Brigades are being disbanded – this was not announced until the end of September 1938. We also see the bust-up between the British and Irish at their base, as well as the battle of Jarama, grossly oversimplified when the reality would have provided a much more entertaining and believable film. The Blueshirts never appear, and General O’Duffy, who led some 700 Irishmen on the side of Franco, is only once casually mentioned by Ryan, when no reference has previously been made to explain him and what he represented. We are consequently faced with the most serious fault that no real attempt is made to explain why Ryan left to fight in Spain in the first place. My concern is that someone watching this film with no knowledge of the context would get the impression that Ryan left simply because he was hot-headed and needed to be in the middle of any fight going. Having said this, the film is worth seeing, and Bell is to be congratulated for bringing Ryan’s story to the screen. One cannot help but feel however that a chance has been missed to provide an entertaining as well as an accurate and educational account of Ryan’s life. Back when I was doing my undergraduate, for my final year dissertation class I was in a group looking at aspects of Irish Diaspora history. My own project was on the impact of Irish emigration on American folk music. In particular, I was concerned with pre-Great Famine migration from Ireland to the United States – by and large this meant Ulster Protestant migration to the Appalachian region. The links between English, Scottish and Irish ballad traditions and those of the Appalachian regions are well-established, although at the time it was revelatory for my historical knowledge – the transformation of music across time and landscape was truly incredible. Ever since then, in the tutorials I give to first year students of twentieth century Irish history, I ask them in one class to examine two separate political traditions in Ireland by examining the texts of the Ulster Solemn League and Covenant and the Proclamation of the Irish Republic; As well as that I get them to consider representations of these opposing political viewpoints via song. Utterly authentic in its historicity, it is nevertheless an anachronism, written almost 60 years after the fact. One could be easily fooled that this was the real deal, a turn of the century broadside style ballad – but it’s nothing of the sort. So, the ballad can be a space of contested control of the past, just like history books can be. We can get multiple versions of our past from any one place, from any single tradition, but a good historian will welcome the contradictions, seek to make sense of them, and whistle to their own tune. ¹ Seek out Fintan Vallely’s Tuned Out: Traditional Music and Identity in Northern Ireland, Cork: Cork University Press, 2008 for more on music in the Northern Irish context.